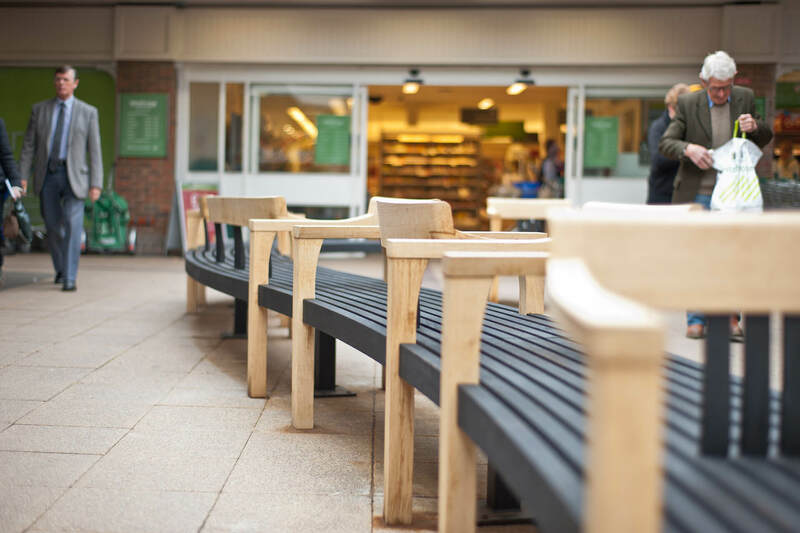 Simon Thomas Pirie were asked to replace the existing public seating in Tudor Arcade, a medium sized retail development in Dorchester, which was going through a substantial renovation and refresh. The new public seating was to act as a focal point, a meeting place and conversation piece on top of its existing seating and resting functions. We were approached by Hutchison Kivotos Architects of London to develop design concepts. They came to us as they wanted to source high quality craftsmanship within Dorset. ‘Craft’ was a key element in the refurbishment of the arcade; this was also reflected in new skylight roof structures for which we also helped source sustainable local materials for. 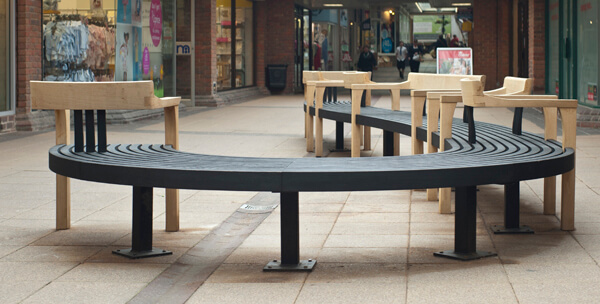 The final form of the bench is a snaking question mark, providing over 11 metres of seating in one run. The scorched oak seat slats follow the gently curved shape. Contrasting natural oak chair and bench forms rise to form seating opportunities on all faces; single throne like chairs, love seats (side by side but on opposite faces), 3-seater benches as well as areas of open bench. This helps to create all sorts of sitting opportunities and social interactions (or not in the case the single seats at each end). The inside face of the curve offers some natural protection from the stream of shoppers passing and trolleys heading into the Waitrose store just metres away. I wanted to create a strong contrast between black scorched bench area and the seat / bench elements. I had this vision of seeing the first end-on bench that faces up the arcade appearing to float like some kind of throne. The making processes of steam bending and scorching can be seen in our video below. 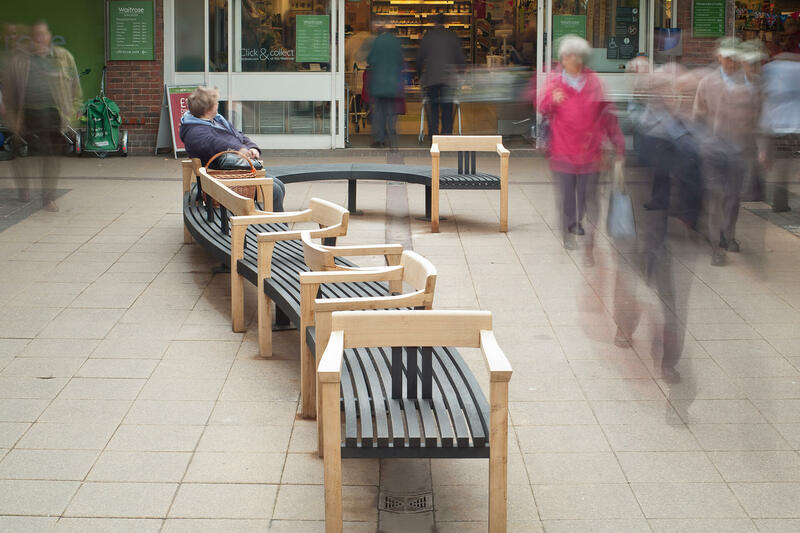 The bench is made from locally grown oak from the Illchester Estate. The estate woodland is managed by Andrew Poore, who was one of the first to establish FSC certification in UK forest management. Sourcing local materials whenever possible goes back to my Hooke Park College training in 1993/4 (part of John Makepeace’s Parnham Trust). As it happens Andy Poore was the Forestry consultant on that course. The other aspect of the Tudor Arcade bench project which gives me great pleasure is the combination of using very high-tech CNC manufacturing, combined with the rather low-tech discipline of steam bending. Both were key in the making process along with a great deal of hand craftsmanship. 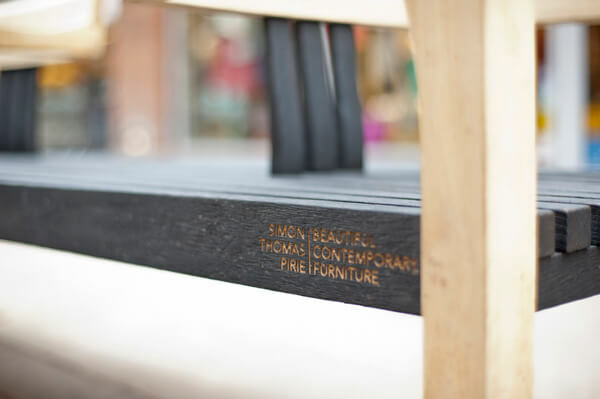 The contrasting finishes of the natural oak chair elements next to the black scorched and scrubbed oak of the curving bench slats is another very distinctive feature of the piece. This is clearly not an ‘off the shelf solution’ and that is something almost everyone recognised as we were installing it and talking to the public.